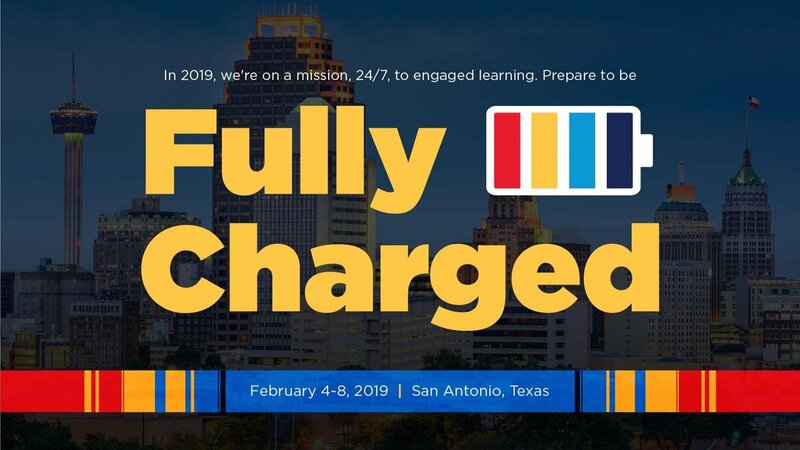 Home Tags Posts tagged with "2019 TCEA Convention"
If you will be one of the thousands of dedicated educators joining us in fabulous San Antonio February 4-8, then you know that this is the first time TCEA has been to the Alamo City for convention. That means that you may be feeling a little out of your depth with all of the changes occurring because we’re in a new place. But never fear! I’m here to share all of the must-know tips and tricks to make you feel at home and have the very best professional learning experience ever. So read on to be in the know! There are more than 1,100 learning opportunities at the convention this year. That’s a lot, so many that it can sometimes be overwhelming deciding what to go to. So the first thing you should do is to select one or two topics of need that you want to focus on at the event. Maybe your district is implementing iPads or Chromebooks or you want to learn more about blended learning or how to incorporate STEM in your classroom. Pick one or two big topics to concentrate on and spend most of your time at those sessions. Concentrating will ensure that you don’t feel scattered or overwhelmed and that you have a solid plan to put into place when you return to your campus. Of course, this doesn’t mean that you can’t attend sessions on other topics, but simply that you will have a strong focus to keep you anchored. Next, download the TCEA app. We are using a new app company this year. So if you have our old app downloaded, it won’t work for this event. Search your App Store for ‘TCEA Convention‘ and download the app. With the app installed, you can now search for presentations on your two topics. Tap “Start” and then “Session List.” You can type your topic in the search bar at the top. Once you find a session you want to attend, use the Bookmark to mark it for later. Because there will be so many attendees at the convention, you will need to have a backup plan in case one of the sessions you want to take part in is full. And for those presentations that you absolutely have to get into, get there early! The sessions are provided in a wide (and dizzying) array of formats to best meet each attendee’s learning needs. You can read up on what each one offers here. The weather should be pretty nice for February. There is a chance of rain on Thursday, but otherwise, it looks great. Convention centers can be cold places, regardless of the weather outside. Especially on Monday and Tuesday, when there are usually fewer people in the building. So plan on wearing layered clothing that you can remove as needed. WEAR COMFORTABLE SHOES! This is not a fashion event. You will be walking anywhere from two to five miles a day in this big place. So wear cushiony socks and really comfy shoes. With all of that walking, it’s easy to get dehydrated. The convention center has water fountains and some water coolers scattered around. So your best bet is to bring a refillable water bottle instead of paying too much money for bottled water there. And because you may want to skip lunch to get in an extra session, pack some snacks: fruit, nuts, crackers, cheese, whatever will keep you energized for all of the learning that you’ll be doing. The main lobby is on Level 1. It’s where most people will enter the center and where the shuttles will drop you off. 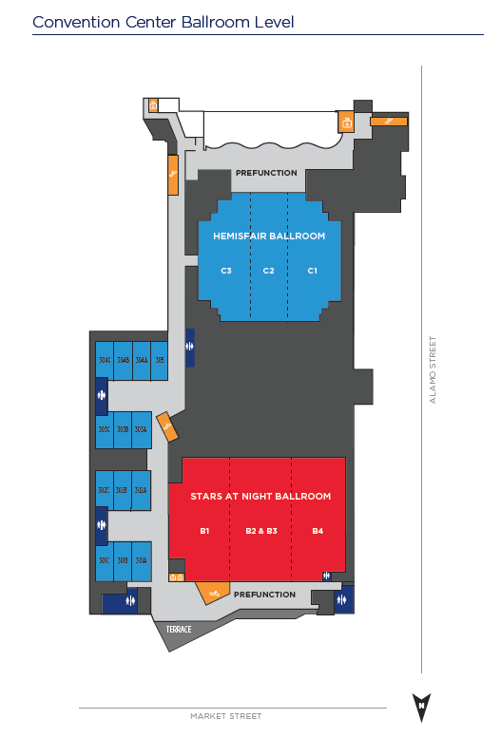 Here, you’ll find registration, volunteer check-in, the membership booth, social media wall, exhibit hall main entrance, and exhibitor registration. 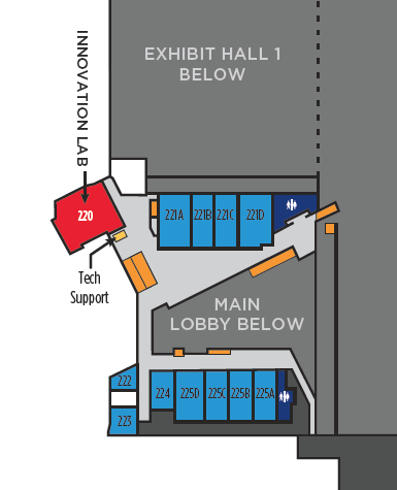 Also on Level 2, you’ll find the poster sessions, Innovator Spotlight, Google room, SMART room, CDWG room, Microsoft room, and the Amazon Web Services room. 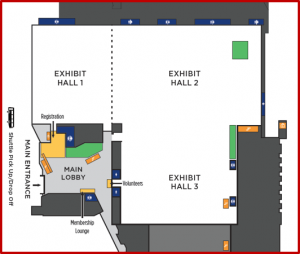 The BYOD workshops, featured presenters, and keynote sessions can be found on Level 3 (below). Additional maps are available in the app and in your printed program. San Antonio is an amazing city and has so much to offer. So don’t just leave the convention center and spend the rest of the evening in your room. Two longtime San Antonio residents, Convention Chair Elect Charlotte Dolat and Area 20 Director Caleb Hudgens offer their insider ideas for the best places to visit after your learning day is done. You can catch their fabulous tips in this video. You’ll be glad that you read to the end of this blog because of the three secrets that I’m going to share with you now. First, if you arrive a little early for the Tuesday keynote, you’ll receive a fabulous momento of your experience at TCEA in San Antonio. (And, of course, you’ll get to hear the amazing Mae Jemison!) Seating for this event is limited. Also, the TCEA Membership Booth is having a special contest during the convention. 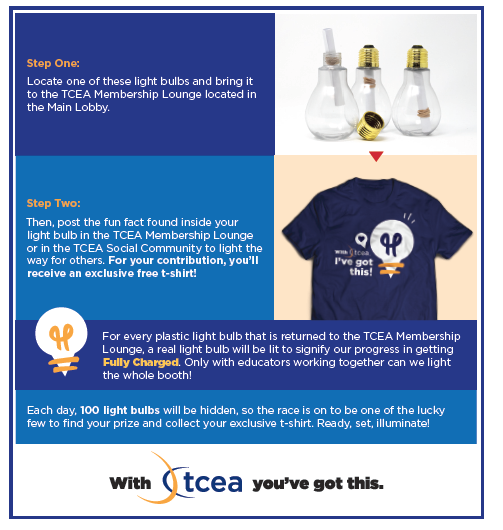 Each day, the membership staff will hide 100 plastic light bulbs that contain a tech tip, a TCEA fact, or other interesting piece of information around the convention center. If you find one of these light bulbs and bring it to the Membership Booth, you will receive a free t-shirt. In addition, you’ll help to light up a real display as we all get Fully Charged! Finally, if you can find me during the convention (I’m usually wandering around! ), I’ll be happy to provide you with a unique ribbon to add to your badge. As you may know, having the most ribbons on your badge is a standard non-game that we play at TCEA each year. Be sure to take full advantage of this amazing learning experience by following all of these tips, which will guarantee that you leave San Antonio FULLY CHARGED! We’re excited that Learning.com will be in San Antonio in February for the annual TCEA Convention & Exposition. For the 2019 Convention, we’ll be at Booth #937 and welcome you to share your experiences and learn how Learning.com helps you and your students meet TA-TEKS standards, prepare for online assessments, and excel in a digital world. Here’s a sneak peek of what you can expect. Do your students lack proficient keyboarding skills? Prepare them for success with Adaptive Keyboarding, a TA-TEKS standards-aligned, gamified curriculum that includes direct instruction, guided practice, application exercises, and quizzes. Students master proper touch-typing techniques and effectively use word processing tools in real-world situations. Students and educators monitor their progress through instantaneous results and dashboards and show success by obtaining mastery badges and levels. Want to prepare your students for opportunities in computer science and coding, but not sure where to begin? Introduce them to coding concepts with EasyTech’s computational thinking lessons which help them develop a foundation in cognitive skills and problem-solving processes. Students apply their computational thinking skills with real programming languages in EasyTech’s coding curriculum to solve challenges and work towards building their own apps and games. Because our lessons contain detailed teacher resources, lesson plans, and solution sets, getting your students to code has never been easier—even for teachers with no prior coding experience. Equip students with the skills they need to stay safe online, determine what information is credible on the internet, and make informed decisions. EasyTech’s positive, research-based approach to online safety and digital citizenship helps educators take on tough issues such as cyberbullying and encourages students to be aware and safe online. It can also be used to document compliance with federal e-Rate requirements. Can your students communicate, collaborate and create effectively with word processors, spreadsheets, and presentations? EasyTech provides students with understanding and practice with these vital digital tools and more. These technology applications are presented in a generic software environment to help students transfer their knowledge and skills to a variety of business applications they may encounter to in high school, college, and the workforce. How do you know your students are truly digitally literate? Our Digital Literacy Assessment can tell you the answer. These assessments help districts gain practical insight into how well fifth- and eighth-grade students comprehend digital literacy concepts and apply digital skills. 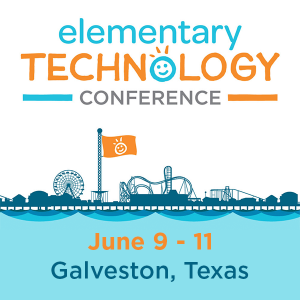 Digital Literacy Assessment been awarded the ISTE “Seal of Alignment” and provides the real-time data and easy-to-interpret dashboards needed to make informed decisions and ensure students are prepared for success. Want to make it easy to teach and learn digital literacy? Deliver EasyTech digital literacy curriculum directly in Google Classroom, Canvas, Schoology, or most other learning management systems. Students and teachers not only access and consume EasyTech curriculum in your school’s own learning management system; they also monitor progress and check grades as well, saving time and frustration associated with learning new platforms or managing multiple logins to multiple learning platforms. This is a sponsored blog written by Jeff Meyer and provided by Learning.com.